Continue below for much about this fantastic pioneer with some pictures of his models. Use BUTTON for more pictures associated with him. 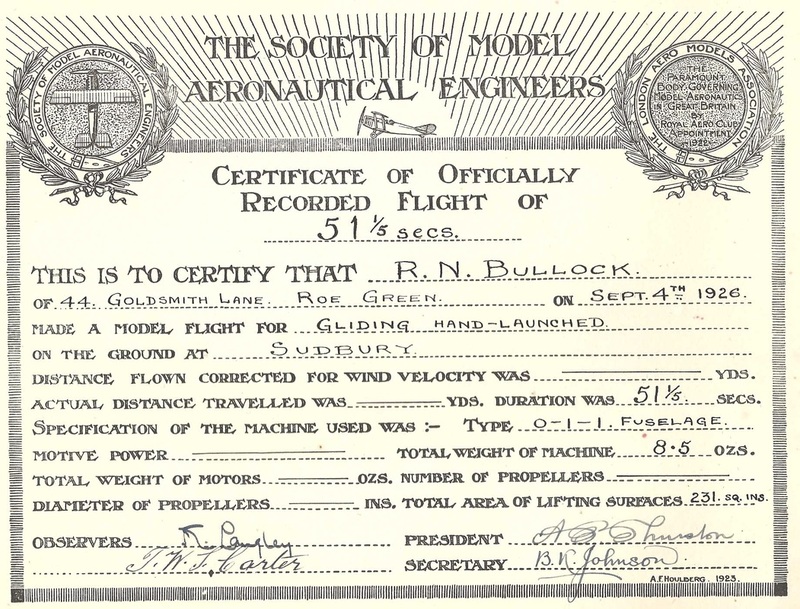 It's difficult to explain what a huge impact Bullock had on the Model Aeroplane world. Hugely talented Designer, Technical Entrepreneur, Constructor, Draftsman and Operator - He was a major influence on associates and also on the modellers who came after him. 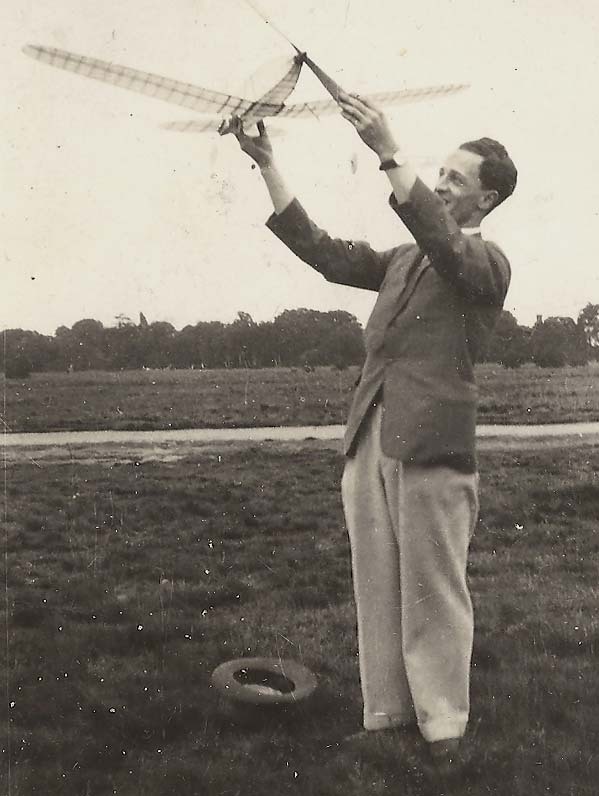 Ralph Bullock was born at Forest Hall, Northumberland, and was interested in flight as a boy, he was the inventor of a 'featherwing' aircraft in 1909 and became an apprentice engineer. 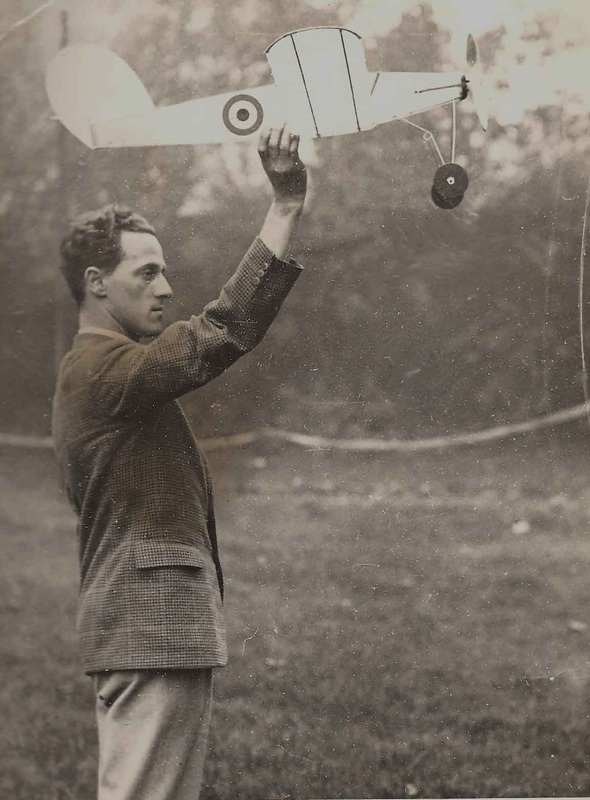 In the 1914-1918 war he joined the Royal Flying Corps (RFC) and survived 11 forced landings - Including one when his aircraft 'crashed upside-down'. During this time he flew D.H.6's, B.E.2E's, R.F.8's, Avro 504's and Bristol Fighters. After the war he tried to bring practical application to his invention of a a plane based on the principles of bird's flight, but received insufficient financial backing and was unsuccessful. He later joined the De Havilland firm as a model builder and flew with Geoffrey De Havilland. 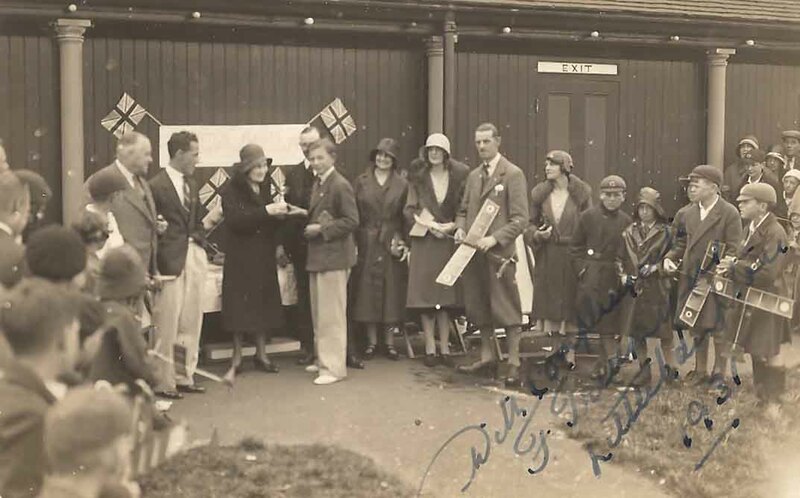 He also worked for the model aeroplane firm of Warnford. 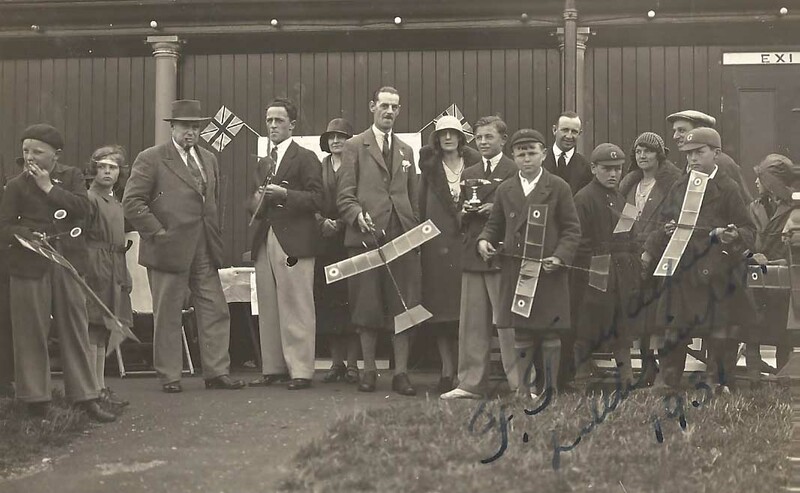 In 1929 he won the Wakefield Trophy for a rubber powered duration model aeroplane. He also won the French Les Ailes cup in 1933-4, the Gamage cup three times, the S.M.A.E cup twice, the Lady Shelley cup and the Pilcher cup. He was a regular contributor to the model aeronautical press. He joined Vickers Armstrong in 1942, working at Winchester, and later at Swindon, when the works removed to South Marsdon. In 1946 he was made an honorary fellow of the S.M.A.E. for his efforts in the model aircraft field. A letter from Mr. A. (Alan?) Kermode to Bullock indicates that the latter had suffered two strokes before 1965. Ralph Bullock died in 1967 at the age of 68 years. This evocative photograph of Ralph Nathaniel Bullock has probably been seen in numerous other places. The last Low Wing aircraft to win the Wakefield Trophy at a time when flight duration was almost entirely related to length of motor (rubber) running time. 'Thermal' lift played little part in extending flight duration. Hardwoods, Wire and Doped Silk were the main construction materials. R N Bullock in white shirt, pale trousers and jacket designed the models. 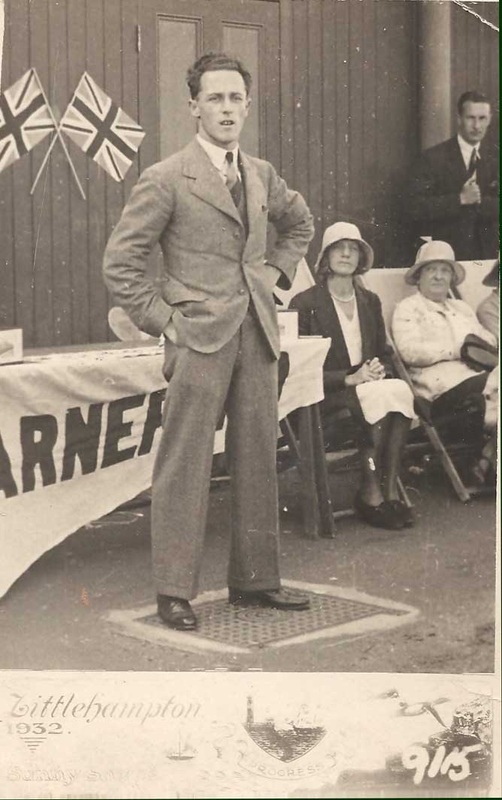 Now who is that tall chap wearing magnificent plus fours? Hats, Ties and Jackets are appropriate wear for flying models! It's very clear from the photographs that Bullock was the driving force behind the occasion. As might be expected, he was technically very astute and some of the detailed sketches of Bird Wings that I have demonstrate his drafting skills. This is possibly quite a rare photograph. I wonder if anbody can produce a plan of the model from this. And where was the photograph taken? There is another picture on Page 2 and some in the 'MODELS' section. 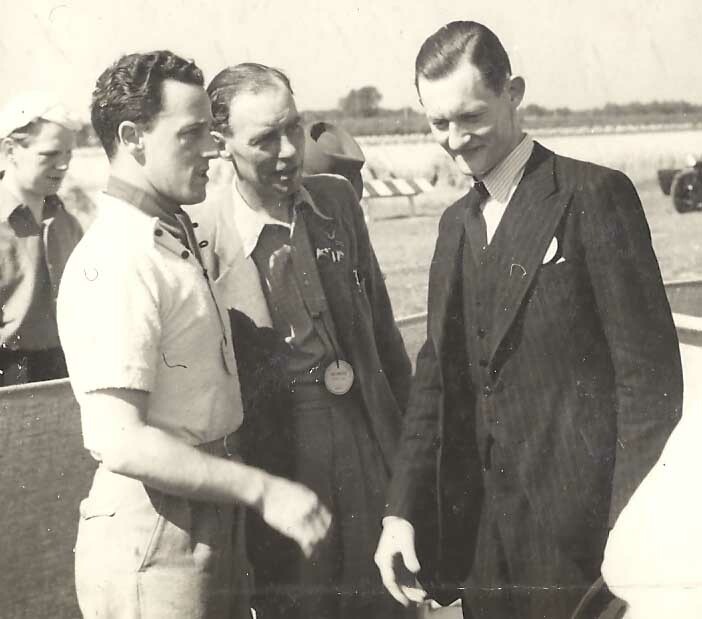 Bullock was a member of the British Wakefield team in 1938. 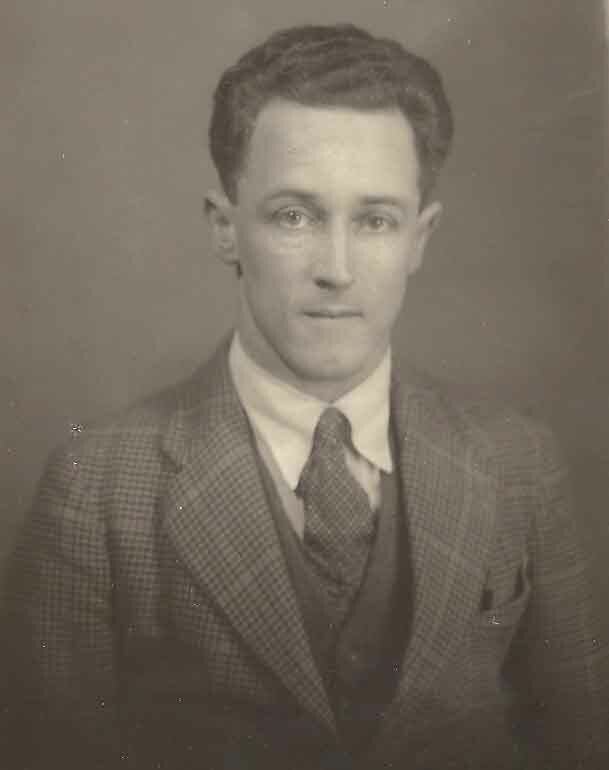 J C Smith was Press Officer for the S.M.A.E. This is actually the replica that I built a few years ago. 'CLICK' on picture to see it fly! Aficianados will squirm at the 'Left/Left' flight path - But this was a very early, very low powered flight. The look of consternation on my daughter's face during the winding phase is genuine!